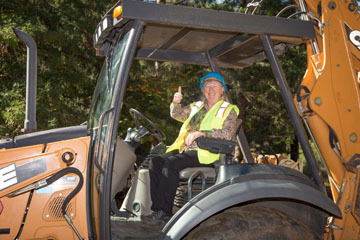 Campus Provost/Executive Vice Chancellor Alison Galloway got a rock star’s welcome when she drove a backhoe to the front of the Quarry Amphitheater. 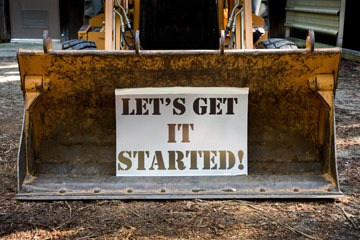 When the bucket loader was lowered, it revealed a message for the crowd: "Let's get it started!" The groundbreaking ceremony drew an enthusiastic crowd. As the Black Eyed Peas song of the same name boomed in the background, Galloway alighted from the backhoe, looking giddy, wearing a robin’s eggshell–blue construction hat. 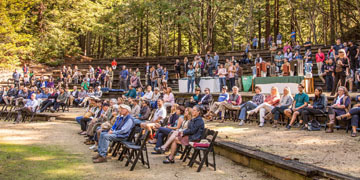 It was a fittingly dramatic and irreverent moment at the groundbreaking ceremony for the beloved and soon-to-be-renovated amphitheater, a stunning outdoor gathering space located in a once-active quarry operation where limestone was extracted to make mortar for brick buildings in San Francisco and throughout the west. The funds will go toward bringing the space back to its former glory, but with modern amenities. Workers will replace the benches, while keeping the place’s unique asymmetry. They will expand the seating from a capacity of 1,636 to 2,000, stabilize the rock walls, make the structure current with building codes and accessibility requirements, introduce lighting for night events, and, at the request of students, put in WiFi. Galloway said she hoped the renovated amphitheater opens next fall. Alice Malmberg, current UC Santa Cruz student and representative for the Student Fee Advisory Committee, praised previous members of that group for stepping up and showing their commitment. “It is such an incredible amount of money for a project that would not even be completed by the time they graduated,” she noted. The histories of this gathering space, and the campus as a whole, are closely linked. When UC Santa Cruz opened to students in 1965, Chancellor Dean McHenry saw the space’s potential as a central gathering space. He hired noted landscape architect Robert Royston, who created the famous and eye-catching asymmetrical arrangement of benches and shape of the amphitheater, serving as a kind of visual echo to the quarry’s sheer and angular walls with redwoods sprouting out of them. Construction finished up in 1967, and for nearly 40 years this was the key place to go for big events. Music boomed, Vietnam War protesters chanted, and Alfred Hitchcock regaled his fans with stories about moviemaking. But the site fell into disrepair and was shuttered in 2006. All too often, the place has been a little too quiet since then. That changed in a big way on Thursday's ceremony with the entrance of the graceful UC Santa Cruz Kahaani dance troupe, which brings eye-catching and stylish Hindi-film dancing to the campus and beyond. It was a fitting occasion for a space that is enthralling whether it is being filled with raucous music, or whether it is empty except for a few visitors and students enjoying a break from the bustle or catching up on their coursework. Dean Fitch, the campus's landscape architect, stood near the top of the big bowl and looked down on the rocks and the forest below.